South Ossetia and Abkhazia, and the new system of international relations that is being built around them, are the focus of attention of the Russian print press today. KOMMERSANT. As Tbilisi has signed the new version of the Medvedev-Sarkozy Peace Plan and immediately attached to it a meaning quite, different from what Moscow put into it, the paper calls the plan in its current state “a Memorandum of Misunderstanding”. The Georgian side suggests that international observers would be monitoring the situation at the “security zones” outside the territories of South Ossetia and Abkhazia, as well as inside the two republics. Russian Foreign Minister Sergei Lavrov says only Russian troops will be working inside the newly-recognised states, writes the paper. The article continues to say that the document in question is not the agreement proper, signed by Russia, the EU and Georgia. The “broader” phrase about observers’ work everywhere in the Georgian territory, points out the paper, is contained in an additional document signed in Tbilisi by President Saakashvili and President Sarkozy on September 9. VREMYA NOVOSTEI calls the new international order around the two Caucasus republics “Military-Diplomatic Relations”. 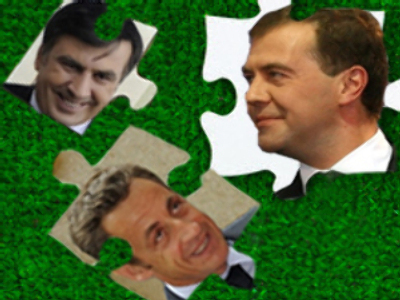 In the lead article the paper says concerning the dual reading of the Medvedev-Sarkozy Peace Plan: nearly everything is more or less clear about which territories will be controlled by the international observers and which – by the Russian military. The only two regions left so far with an unclear future are the Kodor gorge in Abkhazia and the Akhalgor region in South Ossetia, formerly controlled by Tbilisi. These days, continues the paper, the peace keeping force that worked in the region for over 15 years is, in fact, going down in History and leaving the space to be inherited by Russian military units working under agreements between Russia and the two newly-recognised republics. VEDOMOSTI writes this coming Friday that President Dmitry Medvedev will have to participate in a meeting of the Valdai discussion club for the first time. The club that met first in 2004 has since become a regular annual event: a meeting of the Russian leadership with Western political scientists usually dedicated to the most sensitive issues existing between the West and Russia. This time, writes the paper, the topic will be “Russia and the West after the war in South Ossetia”. The paper also adds, quoting a U.S. participant, that the discussion may clarify the question asked oftentimes these days: if Russia has started an open confrontation with the United States. ROSSIYSKAYA GAZETA has an interview with President Sergei Bagapsh of Abkhazia who says his country, now independent and peaceful, will have a lot of work to do in the next few years. His aim, he says, is to rebuild the economy, especially the tourism and hospitality sector which was always traditionally strong in Abkhazia, except in the period between 1992 and 2008 when peaceful living was constantly under threat. Now peace is guaranteed by Russia and the international community, and Russia has also recognised the country’s independence. Now, says the President, Abkhazia can really start to develop in earnest and in a few years become a nation of seaside and mountain resorts, or a whole resort-operating nation. The same newspaper publishes a column by Nikolay Zlobin, Director of Russian and Asian programs at the Washington-based World Security Institute. He writes that the World has passed the era of the U.S. monopoly on the superpower status. The U.S. has failed as the sole center of power, not only because the efforts of Russia and other countries directed towards the creation of a multi-polar world, but largely because of the mistakes of its own administration, the administration of George W. Bush, one of the least successful U.S. presidents in History. However, writes Zlobin, at the moment the World is moving not towards multi-polarity but towards a structure without major power centers at all. He says, the World will soon consist of small states unable to unleash a global war but constantly conflicting with each other. Such a World is equally alien to the U.S. and Russia, so at the moment there may be more factors at work that unite the two nations rather than divide them.